Owning up to one’s mistakes is considered one of the hallmarks of maturity. But the inclination to cover up or gloss over the most egregious boners? That’s how most of us roll. Still, due respect is owed to the insufferably honest among us who fess up even when they don’t have to. 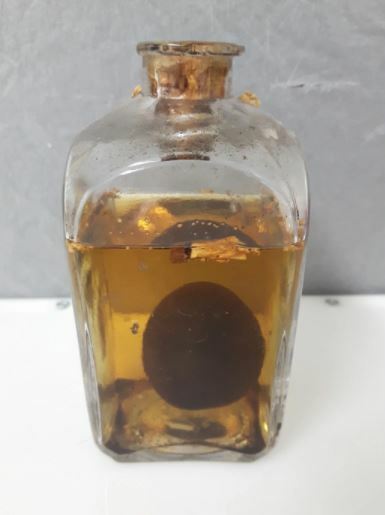 Case in point, the curators and conservators at the Grant Museum of Zoology in London—they inherited a mistake, you might say, in the form of a dusty old bottle found unmarked and uncatalogued in the specimen stores. This itself is far from unusual, especially for natural-history collections. Pre-modern collection methods were haphazard at best, usually resulting from some Victorian gentleman idly gathering objects for his cabinet of curiosities, and these in turn being later donated en mass by heirs or estate agents. Museums tended to accept such largess with weary smiles, before shucking them onto the back shelves for some later docent to suss out. That was the assumption here—an orbular artifact, preserved in a sweet-smelling solution, long ignored, at long last noticed. Museum manager Jack Ashby recounts the story in an engaging blog post, recounting how curators recently decided to take a closer look. A lot of early assumptions were quickly ruled out: it wasn’t an eyeball or a testicle. It wasn’t biological at all, in fact. It was self-evidently mysterious, though, in that its diameter was more than twice that of the bottle’s neck. How did it get in there? That was the clue that (probably) broke the case. What do you find in a fancy bottle alongside a pickled, smooth-skinned orb? Souvenir plum brandy. A century or so of infusion likely swells the fruit to this sort of state. A label falls off, the bottle is forgotten, then later found by descendants who assume it must be “museum material.” It winds up in a museum collection, where it’s forgotten and found all over again. Ashby admits this is speculation—conservators have disposed of the original liquid without testing it (they said it smelled boozy, though)—and have refilled the bottle with a more suitable preservative. They’re opting to hold on to the plum, speculation be damned. They’ve been entrusted with it, after all. It might be someone’s long-lost libation, but hey, curators gonna curate. We just think it’s awfully nice of them to share the unlikely tale. This entry was posted in New Post and tagged booze, Grant Museum of Zoology, Jack Ashby, oops. Bookmark the permalink.